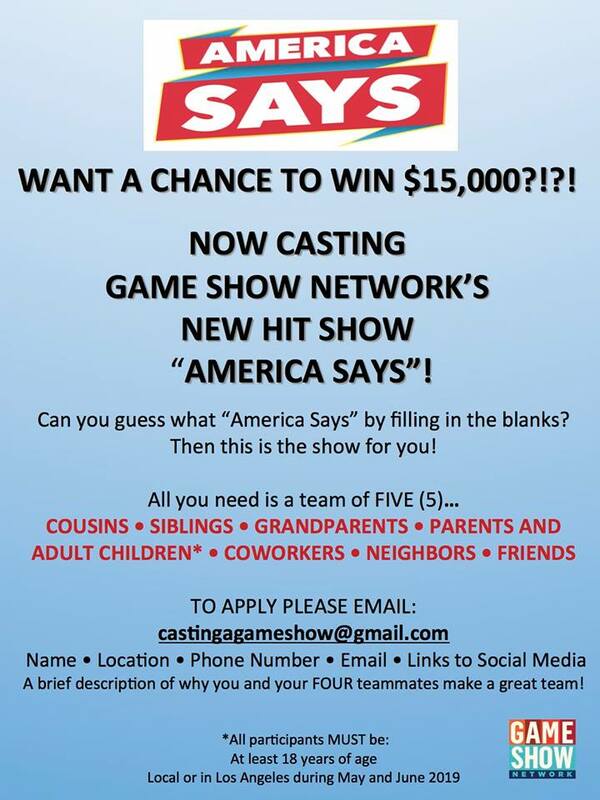 The Game Show Networks “America Says” Game Show is still casting contestants. The series is hosted by John Michael Higgins and according to their description, is a game show styled after the popular HQ Trivia mobile app. In “America Says,” two teams face off to guess Americans’ responses to questions covering a variety of topics with John Michael Higgins moderating it all as the host. Those interested are able to apply online by answering questions on a form. LAST CHANCE! Game Show Network’s new hit show, “America Says” is casting for only one more week! For your chance at $15,000. Teams of 5, Ages 18 – 99, With Big, Fun Personalities. I’m available! At 88 I have to walk with a cane but I still remember my high school Latin and Spanish and speak French (fluent), German (not so fluent but with excellent Aussprache…) Was a Jeopardy! Seniors contestant in 1992. Have taught the above languages in different venues. Am a published newspaper writer and was a magazine editor in Maryland for a year. Grammar geek par excellence. Would love to be on TV game shows. I am extremely delighted to see that there is casting for this show. My family watches this show together. We’re very competitive and would love the opportunity to show you. I am registered with SAG performers With Disabilities. I have been a Screen Actor’s Guild Member for 30 Years. I am a Former Bikini Model/Dancer/Singer etc,. Please call me to put my team on the screen. I am 55 and STILL Showing my best Attributes. Having recently read this website’s casting notice, “Get Cast On GSN’s America Says Gameshow”, it doesn’t provide an e-mail address and/or other contact information on how to apply to it. Hope to hear back from you soon, thanks. You are right! The link was nowhere to be found. Sorry, it is now in the post.